We are experiencing intermittent phone issues with our 602-534-2433 (AIDE) appointment line. We are working a resolution. It is that time of year again. Tax Time! Since 2003, the City of Phoenix Human Services Department has implemented an Earned Income Tax Credit (EITC) Campaign. Every year millions of dollars in tax refunds go unclaimed because people are unaware of the various credits available to them such as the EITC, a refundable federal income tax credit for low-income working individuals and families. There are several ways to get free tax help. Federal workers affected by the government shutdown can receive assistance of up to $400 per year for each quaifiying residential water customer with the city of Phoenix. To qualify, at least one member of the household must be a federal employee affected by the shutdown, and individuals will be asked to provide proof (government ID and/or paystub). Assistance will be offered through the shutdown and for two months following the reopening of the government. Eligible households should visit phoenix.gov/humanservices/programs/emergency to make an appointment and begin the assistance process. The Healthy Giving Council brings like-minded people and groups together with the goal of providing lasting, long-term help to those experiencing homelessness. Learn more about Healthy Giving at givesmartaz.org. PHX C.A.R.E.S. leads with services to help those experiencing homelessness find long term solutions. PHX C.A.R.E.S. sends trained outreach teams, that take the time to build rapport and trust with people on the street, to encourage them to accept the services and resources that are offered to help end their homelessness. The city receives information about unsheltered homeless through the customer service line at 602-262-6251 or online at PHX At Your Service. The Human Services department staff coordinates outreach and engagement for person living in reported encampments with the goal of connection them to housing and supportive services. Human Services and Community Bridges, Inc. (CBI) outreach teams respond 7 days a week from 5 a.m. to 11 p.m. 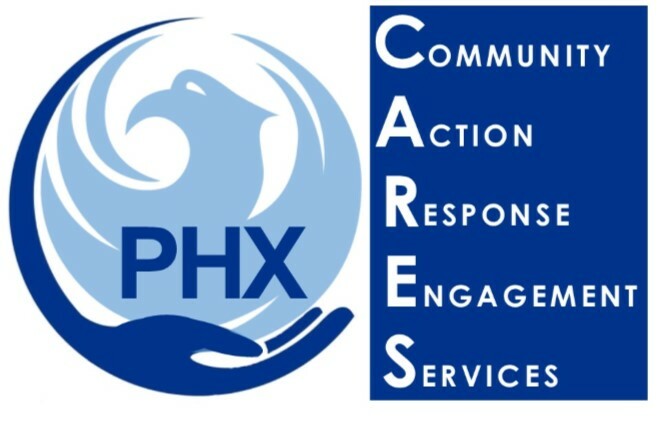 Learn more about the PHX C.A.R.E.S. program at phoenix.gov/phxcares. ​​The Human Services Department provides a comprehensive array of services to help people meet emergency, short-and long-term needs, and help every individual reach their highest level of self-sufficiency. The Human Services Department publishes a variety of publications to keep the public, city staff, Mayor and City Council aware of the department's mission, business operations and financial condition. Publications are easy to download and share.